This is a really lovely vegetarian dish. I’d say it’s pretty enough and tasty enough to serve to guests as well. 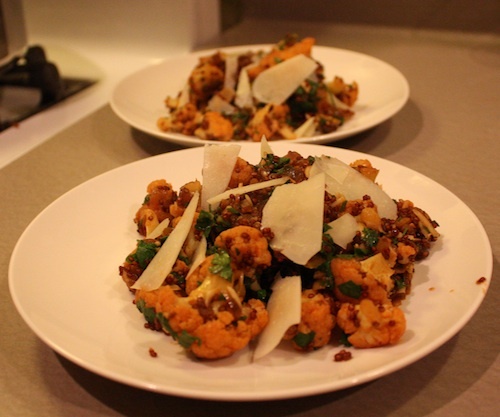 Cauliflower can get a very rich, beautiful flavor when seared and the mixture of spices, nuts and cheese makes this a great winter dish. I found the recipe on Serious Eats. 1. Toast the almonds in a deep skillet over medium-high heat for a couple minutes, just until toasted and fragrant. Remove the almonds from the pan, set aside. In the meantime, chop half the cauliflower and break up the other half into bite-size florets. 2. Return the pan to the heat, add the olive oil and cook the shallot until soft and beginning to color, about 2 minutes. Turn the heat to high and add the cauliflower. Season with salt and pepper. 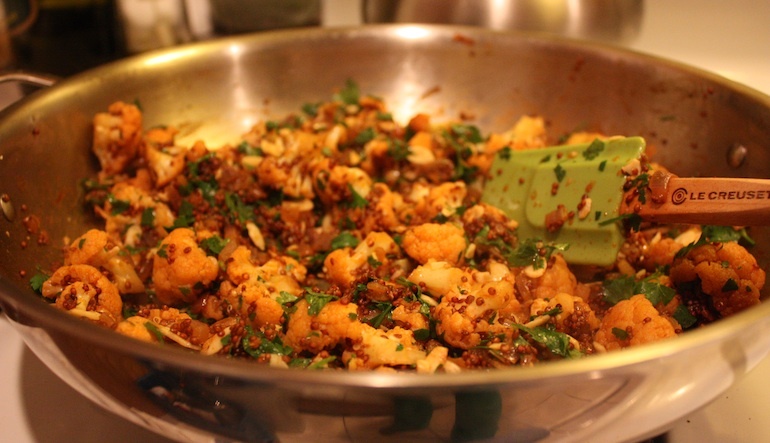 Cook the cauliflower until it begins to soften and color, 5 to 10 minutes. Stir in the couscous (or quinoa) and cook another 3-5 minutes, allowing the grains to be well coated and a bit toasted. 3. Add the smoked paprika, followed by the vegetable stock. Bring to a boil. Once boiling, turn to low heat, cover and cook undisturbed for 5 minutes. Chop the almonds and add them to the pan along with the parsley and fluff with a fork. 4. Garnish with grated or shaved Manchego and serve. Feel free to drizzle with olive oil.